In The Beginner’s Guide to Sewing Knit Apparel, Jessica guides beginner sewists through all of the techniques, tools, tips and tricks to sewing your own clothing from knit fabrics. The guide is full of easy to understand written instruction, picture tutorials, and video links. It also includes hundreds of links to resources, shopping guides, and external video tutorials from other seamstresses. Scroll down for more details. In The Beginner’s Guide to Sewing Knit Apparel, Jessica guides beginner sewists through all of the techniques, tools, tips and tricks to sewing your own clothing from knit fabrics. The guide is full of easy to understand written instruction, picture tutorials, and video links. 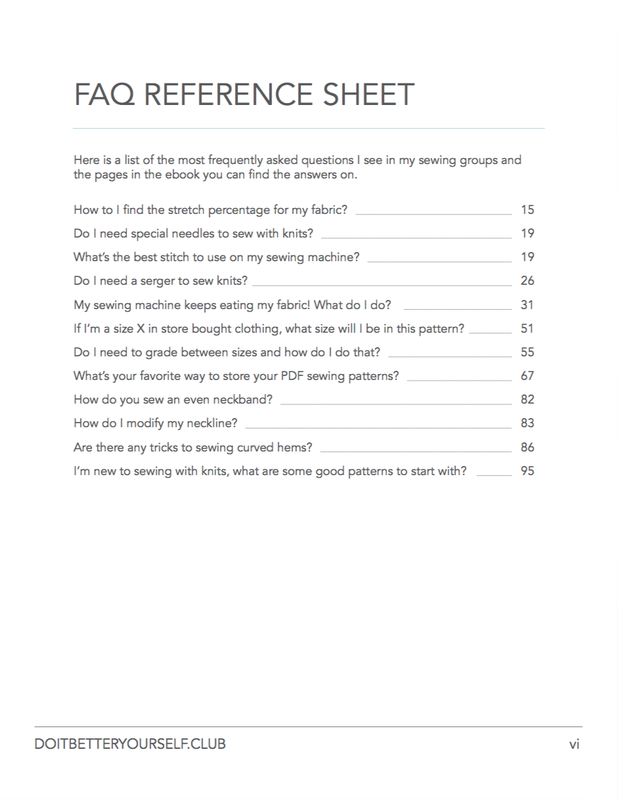 It also includes hundreds of links to resources, shopping guides, and external video tutorials from other seamstresses. Pro tips can be found throughout the guide from influencers throughout the industry to help beginner sewists achieve a professional finish to their garments quickly. With a little guidance and the right tools, you can sew your own personalized and unique knit garments without spending the high price tag of boutique brands. THIS IS A DOWNLOADABLE PDF EBOOK. NO PHYSICAL PRODUCT WILL BE MAILED TO YOU. PDF files are available to view in virtual every web-enabled smart device. Copyright 2017 DoItBetterYourself.club. All Rights Reserved. Wow, I don’t even know where to start! Jessica has totally blown it out of the park with this all encompassing guide to knits I thought it was going to be a review of different kinds of knit fabrics, but it is SO much more than that! Every topic imaginable in regards to knit fabric, sewing with knits, PDF patterns, pdf pattern companies, where to get knit fabric, how to measure yourself, etc. is covered in this amazing manual! I wish I would have had it 3-4 years ago when I ventured into sewing knit garments. I still have piles (and i mean numerous piles) of unusable fabric…. i did not know enough about knits to order the correct fabric:( If you are starting out in knits, or even if you have experience, I guarantee you will learn something new from this guide. The world of knit seamstresses thanks you jessica! I have been sewing for OVER 50 YEARS AND LEARNED SO MANY NEW THINGS IN THIS BOOK! THANK YOU SO MUCH, JESSICA, FOR THE CLEAR, CONCISE EXPLANATIONS! THE VIDEOS AND LINKS TO PATTERNS, KNIT SHOPS AND RESOURCES ARE SO HELPFUL! THIS IS NOT ONLY FOR NEWBIES – ANYONE CAN BENEFIT FROM THE BEGINNER’S GUIDE TO SEWING KNIT APPAREL. This ebook is essential if you want to begin sewing with knits! It will hold your hand through learning about the different types of knit and how they behave all the way through using a pdf pattern for knits. It’s full of links to helpful videos and tutorials too. You won’t regret adding this to your library! Jessica has included every detail one needs to know to confidently begin sewing knits! It’s a great resource that I know I’ll refer to often and the inclusion of tutorial videos was a stroke of genius. Even experienced sewists will find this to be a great resource! It’s the perfect companion for the new seamstress! Jessica guides you through the not so scary world of knits and helps you to overcome the nerves towards your sewing machines and sergers! She also provides you with a great selection as to where to start shopping for knits and a list of great pattern companies that provide fashionable and comfortable patterns for the whole family! 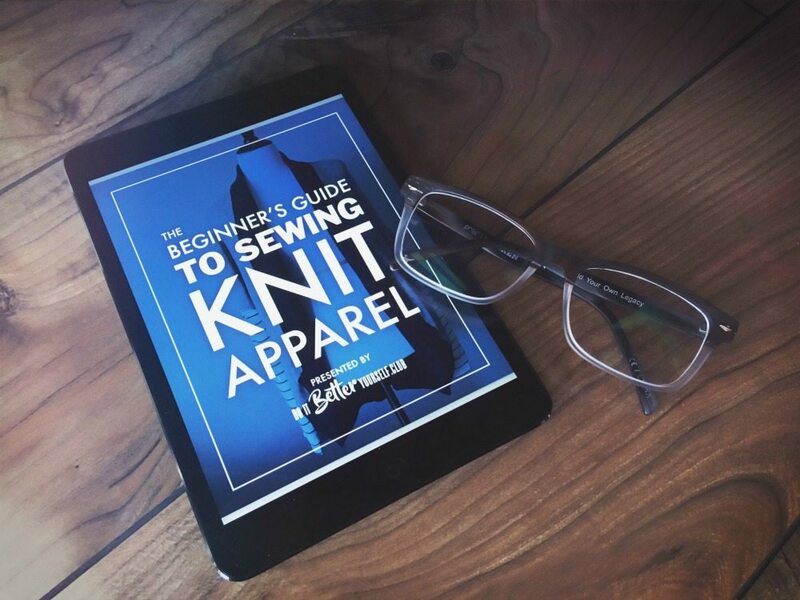 All around this book is a MUST as you begin your journey towards sewing with knits! This book is absolutely amazing. Full of easy to follow tutorials, hints, tips, and tricks!! It is perfect for beginners and a lifesaver for those more experienced! This is a book everyone needs to have!!! Everything you need to know!!!! This book is a must!! A plethora of helpful information and hints. A wealth of resources that are so very helpful. This is not for beginners only. Everyone can benefit from this book. Im a super analytical person and like to make sure i have everything i need before doing something, this book answered so many questions and taught me so many tips! Its a great read for beginners and a wonderful reference for seasoned pros! Such a great resource! It really has the best informatioN in one place. So helpful to new sewers and ones wanting to work with knits. THank you for giving us this wonderful reference! Fabulous information for sewing knits. Jessica provides so much detailed information about everything you need to know to prOduce a quality finished knit Garment. A mjst Have! Pretty good book. Only thing i would want in it is more instructionS for grading. I Have Been So Hesitant To Try Knits, This Took ALL My Fears Away. Thank you!! LOVE THIS EBOOK! ESPECIALLY LINKS TO VIDEOS. THANK YOU. I actually enjoyed reading this from cover to cover — i learned so many cool tricks! Now it’s my go-to reference guide. Thank you so much!! This ebook is must read for those sewing garments with knit fabric. I wish I had this manual when I began my sewing with knits journey several years ago. Great job, Jessica. a perfect, detailed, very well explained book that will teach you All you need to know when working with knit fabric. Incredibly detailed with pictures and Links. Love it. Being new to sewing with knits, I find this book invaluable. I know you can find lots of info on the internet, but having it all collected in one place is just awesome. Links to resource and videos, detailed tips and instructions – its all here. Thanks so much for this wonderful e-book! This book is seRiously amazing! After reading it ive had so many Questions answered (even ones ive asked on faCebook and googled) thank you for the videos too! Im definitely a visUal learner and those helped so mUch! Everyone needs this book! 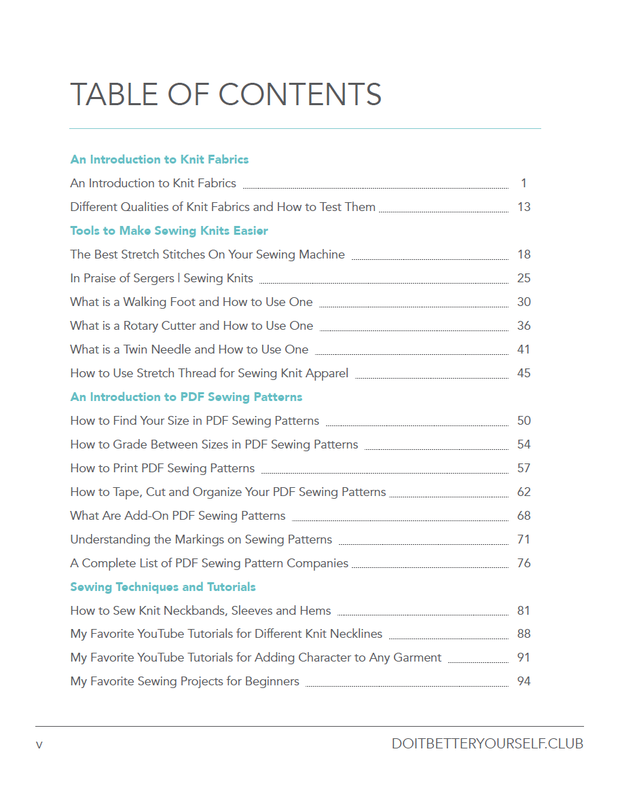 What an awesome comprehensive guide to sewing knits! Even videos are included. Great for novices and experts alike. I’ve been sewing for about a year and a half. I’ve pretty much exclusively worked with knits. This ebook is a lifesaver. i’ve only made very simple things so far. after reading this i feel i can perfect the things i’m already making and tackle some more difficult sewing projects. thank you so much for putting this out there! This book was a great read. It thouroughly addresses the various types of fabrics. I like that there is a section DEDICATED to sewing with a regular sewing machine. However, she does discuss the benefits of a serger. The videos are helpful to me because i am one of those visual learners. To me, She is a true teacher. It is clearly written for anyone to learn about sewing with knit fabrics. Thank you! I’ve been sewing for several years now, and consider myself pretty confident and well-read on most techniques (thank you, internet!) But I still learned heaps from this well set out ebook. I’m looking forward to sitting down with a cuppa and watching all the videos! Thank you for a great resource ? FanTastic factual dOcument which i read one evening in bed. By 9am the next morning i was at the sewing shop buying Ballpoint needles. Im aN Absolute jersey beginner and i learnt so much. Thank you so much fOr this. i AM SO grateful for stumbling across this e-book. I’ve been sewing forever but was too afraid to try knits. Jessica has given me the confidence to give it a whirl, so much information and so well explained. I am going to keep this next to my sewing machine as a handy reference. Thanks so much Jessica. I downloaded this ebook to help me Better inderatand where i have been going wrong with some of my projects. This book made me laugh as much as it taught me. It is beautif ully put together and breaks everything down without being condescending. DEfinitEly something i would reccomend to any of my sewist friends. Great resource For knit sewists of every level! Thank you for putting thiS information togEther in one place. This ebook was both pleasant to read and informative. Her section divisions were great so it made it easy to navigate as well as go back to particular areas that you want to review again later. I love her links so you can get video tutorials (for visual learners) and more info. It’s nice to have opinions and tips of other designers/seamstresses throughout the book. Very well thought out! It’s a great balance of concisely PRESENTing Information that you have to search all over the WEb for and good information. This is an ebook i will keep handy even As i move from beginner status. This is a wonderful resource for sewing knit fabrics. The book covers pretty much any topic related to knits: needles, stitch types, sewing machine and serger, HEms, patterns for knits, fabric stretch, etc. Great for beginners and helpful information for experienced sewists as well. So so great to have all this information in one place, thanks!! I can not add anything more than has already been said. This book has changed how i sew with knits, thank you Jessica for being an inspiration! What a resource!! So grateful for all the super helpful information in one place! Awesome book Jessica ! Tons of great information all in one place. beginners and experienced sewers alike, will find this book very useful. I wish I had this when I was beginning sewing knits, it answers a lot of the questions I had plus so much more. Great chapters with different techniques and some videos too. So helpful! 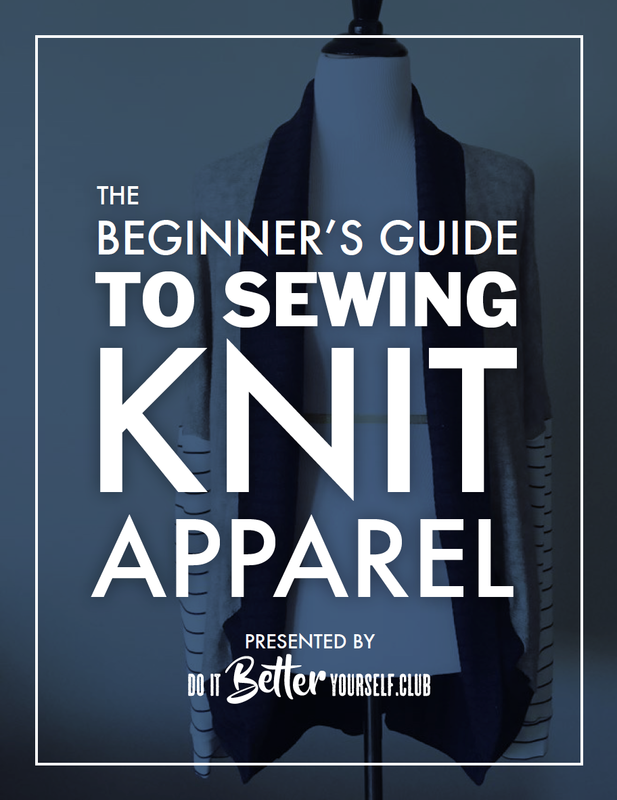 A really great guide for when you’re starting out with knits or need a refresher! Clearly great care was taken when writing this book. It’s very detailed and every subject is covered. I feel it’s not a beginners only guide – advanced sewists would benefit from it too. I have yet to attempt to sew the knit patterns that I have been anxious to make. After reading this book, I do feel more confident that I can make clothing for myself without too much confusion. This book is very well written, with many many valuable resources and LINKS. I can’t thank you enough for putting this all together! This book is packed full of useful tips and tricks. You can tell you poured your heart into it. Thank you for putting together such an awesome guide and resource. Knits always made me mad, Like I had to be in some secret society to understand how to sew them. Thank you for demystifying knits! this book really sums up Everything u need to know to get started. I would STrongly RECOMMEND this book for beginners as it will save u so much time as u start out on your sewing journey. I wish i had this book when i was starting out as i have spent many many hours trying to figure things out myself. But i’ll Definitely be keeping this book by my side as it is a handy reference. JessicA is adorable and you can tell she’s very passionate about sewing. her book explains things very Clearly and also has links to her youtube videos. I watched them all & will probablY re-watch them especially since i’m still very new to knits. Such an awesome sewing resource, packed full of information. I have learnt so much from this ebook and by applying my new knowledge, i have seen a great improvement in my knit sewing projects. All my questions were answered! Thank you! The book is chock Full oF useful information including links to Videos. If you’re a visual/kinetic learner Like me that’s invaluable! It’s a great resource to have for all levels, from beginner to whatever you’d call yourself if you never have to pick out stitches. I wish this had been around when I Started sewing knits! It would have saved me hours of research. Love it! Great book for beginners or intermediate sewist. Covers all you need to know about sewing with knits, especially for those that are intimidated. Not dry and boring like some books. This is a GreAT resourCe for beginners aS well as the experienced. Covers many topics. I simply cannot say enough wonderful things about Jessica, in all of her MUCHNESS!!!!! Wow is one of the first words that come to mind when describing this book to anyone! She answered every question I ever had about sewing with knits and taught me to have fun with it and motivated me to get started. Jessica is an absolute delight and has such a joyful spirit, you will enjoy this book as well as learn all you need to know to get started. This book is a fountain of knowledge as well as resources, from fabric companies to beginner’s patterns to videos she has created and also others that she has learned from. Jessica, you are amazing and your sewist fans (moi included) absolutely LOVE you!!! Its great to have such a wonderful resource pulling all of this information into one place. I love knits, but I’m new to them. This has helped me improve and bring my projects to the next level. I was terrified of knits. I’ve sewn most of my life, thanks to my grandmother, but she always said knits were difficult to work with. When I started to explore the world of knit sewing, someone recommended Jessica’s book to me. Jessica did a wonderful job compiling a lot of information into one resource, and the way she explains different tools or techniques makes them so simple. I’ve made several knit garments now, and I’m so thankful to her for giving me the confidence to try. I recommend her book to anyone in my sewing groups who say they are new to knits! This is a great book for beginners who want to start sewing with knits. I wish it had come out sooner. Would have saved me some struggles. Thank you! I am ashamed to say that I have had this ebook since Jessica first released it and I just got around to looking at it this weekend! This book is AMAZING. I really wish I would have taken the time to look through it when I first downloaded it because if I had, I know I would have already started sewing with knits! Jessica’s instructions and videos are so helpful. I feel so much more confident and she actually answered quite a few questions that I have been afraid to ask! Definitely worth the purchase. Thank you so much. I can’t wait to get started with some knits.